The FEI European Vaulting Championships 2017 had it all! Let’s talk about the Italian pairing of Silvia Stopazzini & Lorenzo Lupacchini – Wow. After finishing 4th at the World Championships last year, narrowly missing out on a medal, this year they were back with a bang with their Samba routine transporting the audience in Austria to Rio – they brought the party with their intense choreography & amazing athleticism - hitting every nuance of their music & winning the first ever senior gold medal for Italy – Amazing! Silvia had previously won Italy’s only ever Junior gold Vaulting medal. 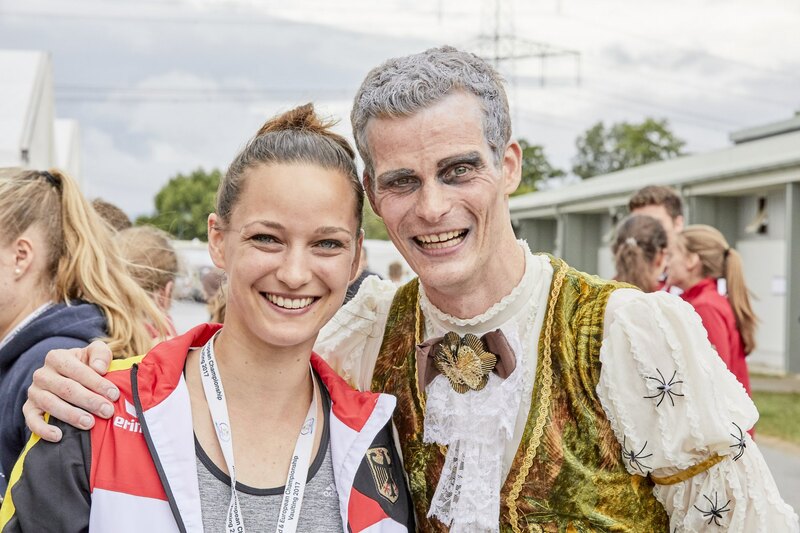 It has been almost a decade since a German women won gold in the Senior Female Individual Class - a medal that has evaded them since 2008, Kristina Boe rectified that. The talented German vaulter who is a doctor by occupation dominated the female class at this year’s European Championships. Whether she was interpreting Rey from Star Wars for her freestyle or Mary Poppins in technical test Kristina Boe is a master storyteller. Together with Don de la Mar & Winnie Schluter she gave her best ever performances to convincingly take the gold medal. 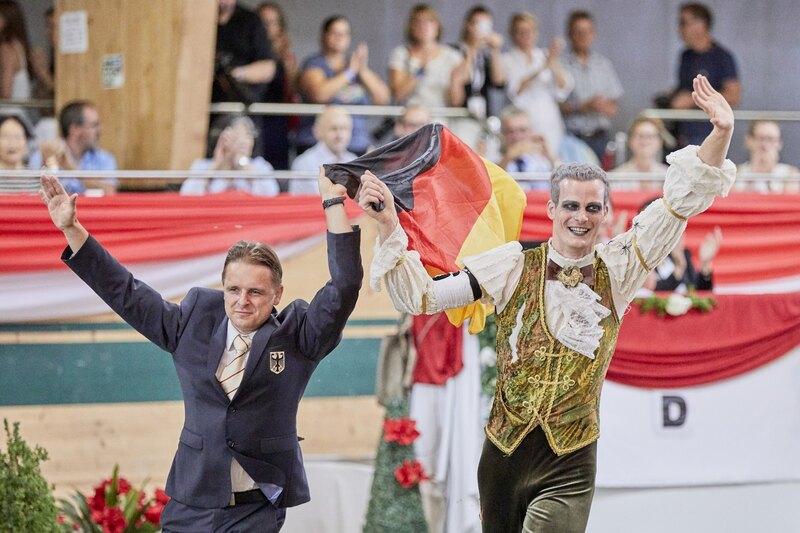 In 1999 the team from JRG Koln won the bronze medal at the FEI European Championships – Nowadays going by the name of Team Norka - this was only their second time ever representing Germany in the team competition (8,419). It came down to a battle as they faced tough competition from Team Switzerland who finished on 8,407. It was extremely close. We were really satisfied, it was a huge honour to compete at the FEI European Championship. The whole competition week we had a really great feeling – we knew we were going to have a great time inside the arena. To be FEI European Champions is amazing. Erik Oese FEI European Vaulting Champion. Erik won the silver medal at the World Championships in 2012, the silver medal at the FEI European Championships in 2013 & bronze at the World Equestrian Games in 2014. Then ensued a couple of years where he wasn’t selected for Germany. This year Erik was back on top form and together with his long term team of Calvador 5 & Andreas Bassler, he brought a haunting elegance to his freestyle routine and was more than deserving to have the gold medal placed around his neck. One of the biggest surprises came when Jannis Drewell was unable to control a transition into his outside bounce & in an otherwise perfect first freestyle he fell from the horse which saw him finish round 1 way down in 9th place. However Jannis, the 2015 European Champion, fought back with a commanding technical test round & second round freestyle to win the silver medal. Whilst Jannis may be a master vaulter with impeccable balance whilst waiting for prize giving to start his chair broke and he fell to the floor much to the delight of the audience. One of the favourites coming into the event and straight off the back of her resounding win at the CHIO in Aachen Janika Derks was expected to be a firm gold medal contender. However, her horse Auxerre 2 was not enjoying the competition arena at the Magna Racino and she found herself in 14th place after the first round - she subsequently withdrew from the competition. Italy’s Anna Cavallaro had also been expected to be a gold medal contender. However, throughout the competition with Monaco Franze 4 she never quite found the form that won her the FEI World Cup™ earlier in the year. Unfortunately Team France had to make the tough call to withdraw from the competition due to horse issues. France, had been sitting in 4th place going into the final round, but the horse is such a huge part of the team and their wellbeing is always put first.